Roman Lewkowicz has been dancing Ukrainian folk dances, in the Binghamton area since the age of three. Beginning in 1991, Mr. Lewkowicz had the opportunity to study with Roma-Prima Bohachevsky. 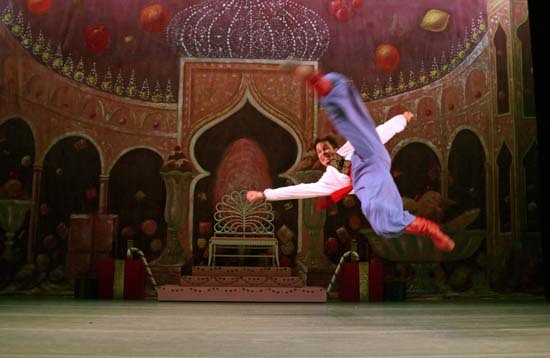 He, later became a member of Mrs. Bohachevsky's New York based Ukrainian Dance Ensemble Syzokryli. In 1994, he was accepted to Duquesne University and the Eastern European folk ensemble, the Tamburitzans. During his three-year stay with the Tamburitzans, Mr. Lewkowicz had the opportunity to learn from the most prestigious choreographers of Europe and the United States. Touring all across the United States, the ensemble performed over 90 shows per season. OBRIJ Folk Song & Dance Ensemble at the Yonkers Festival. Choreographed by Roman Lewkowicz. In 1998, Roman Lewkowicz was accepted as a dancer with the Dukla Ukrainian Folk Company, otherwise known as PUL'S (of Presov, Slovakia) for an entire season. His eighth trip to Slovakia, in the summer of 2001, provided him with another opportunity to add another choreography to his name and to Dukla's repertoire. As the company celebrates its 45th season, both choreographies are active sets to the company's repertoire. In 2000, he was asked as a guest instructor of Ukrainian and Russian folk/national dance at the Sudly dance and arts studio in Manassas, VA. This is the first time the studio has offered a class with this type of emphasis. Mr. Lewkowicz has taught Ukrainian dance in Pittsburgh, PA, Syracuse, NY, Manassas, VA and Windham, CT. Currently, he is the instructor of Ukrainian dance in S.U.M. Passaic, NJ and a dancer & guest choreographer for the Limbora Slovak Ensemble of New York City. Roman Lewkowicz, Mikhail Smirnov, Victoria Pichurova, Valentina Kvasova, Olga Chpitalnaia, Natalia Ejova, Mikhail Nesterenko, Stefan Kuziw photos from Slavic Cultural Festival that took place on September 29, 2007 at the McLean Community Center, 1234 Ingleside Ave., McLean, VA. Ensemble Barynya shared the stage with the Kazak Family Trio of Belarus, the Bandura Tells of Ukraine, and local organization, the Washington Balalaikas Society Orchestra.